In the midst of a continuous evolution of technology and business, the progress of which never halts, it is vital to that one remains involved and enlightened with it all. When we talk about a business, there are many forms that come into mind, a listed company, a private company, a partnership or what not. Whichever form of business you consider, be in a bank or a not-for-profit organization, all are aimed at spreading their name out in the market to gain benefit from it, be it personal or for others. Whichever way you talk about, marketing is an essential element of every business without which success in simply a tough nut to crack. When the title marketing comes to mind, different strategies are taken into consideration and one classic and vintage strategy which is considered a powerful marketing tool for a few decades now, is the Business Newsletter. 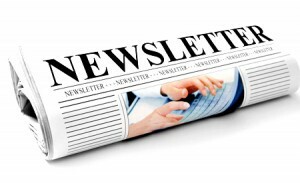 For those who are not familiar with this term, a Business Newsletter is an official publication distributed at regular intervals to specific audiences via print or email. It is a form of communication in order to get attention or share information with the stakeholders of a business, i.e. all the people being affected by the business and its activities. An External Newsletter can be directed at the customers and the members of the society for the purpose of spreading awareness and establishing certain goodwill in the market, as it makes the concerned party feel involved in the business and their procedures. An Internal Newsletter, an easy form of communication can keep the employees informed regarding new policies, procedures and awards. It can prove to be an important educational tool by strengthening the relationship between the employer and the employee. Apart from these very obvious reasons, a newsletter can become a reflection of the company’s ideology, which helps establish it as a successful entity in the market. Most newsletters nowadays are a strong part of ‘relationship marketing.’ As the name suggests, this strategy is aimed at building strong relationships with your clients by keeping in touch with them. This includes providing your clients with latest updates about their product or service and during the process, adding a few marketing pointers of yours to help you out. A precise example to support this relationship is of stock market trading newsletters. These newsletters update clients about the stocks which are top trending. Apart from establishing open and honest means of communications, a newsletter can also help build credibility, which is always important when it comes to brand recognition and in turn, brand loyalty. Brand loyalty and recognition is also important when it comes to Sales, which is also increased through the informative awareness of the products and services being provided.